"President for One Day" and "President for a Day" redirect here. For other uses, see President for One Day (disambiguation). David Rice Atchison (August 11, 1807 – January 26, 1886) was a mid-19th century Democratic United States Senator from Missouri. He served as President pro tempore of the United States Senate for six years. Atchison served as a major general in the Missouri State Militia in 1838 during Missouri's Mormon War and as a Confederate brigadier general during the American Civil War under Major General Sterling Price in the Missouri Home Guard. 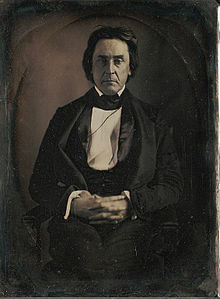 He is best known for the claim that for one day (March 4, 1849) he may have been Acting President of the United States. This belief, however, is dismissed by nearly all historians, scholars, and biographers. Atchison, owner of many slaves and a plantation, was a prominent pro-slavery activist and Border Ruffian leader, deeply involved with violence against abolitionists and other free-staters during the "Bleeding Kansas" events. Atchison was born to William Atchison in Frogtown (later Kirklevington), which is now part of Lexington, Kentucky. He was educated at Transylvania University in Lexington, where his classmates included five future Democratic senators (Solomon Downs of Louisiana, Jesse Bright of Indiana, George Wallace Jones of Iowa, Edward Hannegan of Indiana, and Jefferson Davis of Mississippi). Atchison was admitted to the Kentucky bar in 1829. In 1830 he moved to Liberty in Clay County in western Missouri, and set up practice there, where he also farmed. Atchison's law practice flourished, and his best-known client was Latter Day Saint Movement founder Joseph Smith. Atchison represented Smith in land disputes with non-Mormon settlers in Caldwell County and Daviess County. Alexander William Doniphan joined Atchison's law practice in Liberty in May 1833. The two became fast friends and spent many leisure time hours playing cards, going to the horse races, hunting, fishing, attending social functions and political events. Atchison, already a member of the Liberty Blues, a volunteer militia in Missouri, got Doniphan to join. When the earlier disputes broke out into the so-called Mormon War of 1838, Atchison was appointed a major general in the state militia and took part in suppression of the violence by both sides. 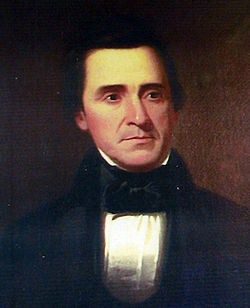 In 1838 he was re-elected to the Missouri State House of Representatives. Three years later, he was appointed a circuit court judge for the six-county area of the Platte Purchase. In 1843 he was named a county commissioner in Platte County, where he then lived. In October 1843, Atchison was appointed to the U.S. Senate to fill the vacancy left by the death of Lewis F. Linn. He thus became the first senator from western Missouri. At age 36, he was the youngest senator from Missouri up to that time. Later in 1843, Atchison was appointed to serve the remainder of Linn's term and was re-elected in 1849. At Atchison's request, Senator Stephen Douglas of Illinois introduced the Kansas–Nebraska Act, which embodied this idea, in November 1853. The Act became law in May 1854, establishing the Territories of Kansas and Nebraska. Both Douglas and Atchison had assumed that Nebraska would be settled by Free-State men from Iowa and Illinois, and Kansas by pro-slavery Missourians and other Southerners, thus preserving the numerical balance between free states and slave states. In 1854 Atchison helped found the town of Atchison, Kansas, as a pro-slavery settlement. The town (and county) were named for him. The outrage was nonetheless accepted by the Federal government. When Territorial Governor Andrew Reeder objected, he was fired by President Pierce. Despite this show of force, far more free-soilers than pro-slavery settlers migrated to Kansas. There were continual raids and ambushes by both sides in "Bleeding Kansas". But in spite of the best efforts of Atchison and the Ruffians, Kansas did reject slavery and finally became a free state in 1861. Charles Sumner, in the epic "Crimes Against Kansas" speech on May 19, 1856, exposed Atchison's role in the invasion, tortures, and killings in Kansas. Speaking in the flamboyant style he and others used, lacing his prose with references to Roman history, Sumner compared Atchison to Roman Senator Catiline, who betrayed his country in a plot to overthrow the existing order. For two days, Sumner listed crime, after crime, in detail, complete with documentation by newspapers and letters of the time, showing the tortures and violence by Atchison and his men. Two days later, Atchison gave his own speech, totally unaware as yet that he was exposed on Senate floor in such a fashion. Atchison's speech was to the Texas men he just met, hired and paid for, Atchison reveals in his speech, by "authorities in Washington". They are about to invade Lawrence Kansas. Atchison makes the men promise to kill and "draw blood," and boasts of his flag, which was red in color for "Southern Rights" and the color of blood. They would press "to blood" the spread of slavery into Kansas. He revealed in this speech that the immediate goal of the invasion was to stop the newspaper in Lawrence from publishing anti-slavery material. Atchison's men had made it a crime to publish anti-slavery newspapers in Kansas. Atchison not only makes it clear the men are to kill and draw blood, he tells the men they will be "well paid" and encourages them to plunder from the homes they invade. This was after the hundreds of dozens of tortures and killings Charles Sumner had detailed in his Crimes Against Kansas speech. In other words, things were about to get much worse, now that Atchison had his hired men from Texas. Atchison's Senate term expired on March 3, 1855. He sought election to another term, but the Democrats in the Missouri legislature were split between him and Benton, while the Whig minority put forward their own man. No Senator was elected until January 1857, when James S. Green was chosen. When the First Transcontinental Railroad was proposed in the 1850s, Atchison called for it to be built along the central route (from St. Louis through Missouri, Kansas, and Utah), rather than the southern route (from New Orleans through Texas and New Mexico). Naturally, his suggested route went through Atchison. Atchison and A. W. Doniphan would fall out over the politics preceding the Civil War and on which direction Missouri should proceed. Atchison favored secession, while Doniphan was torn and would remain for the most part non-committal. Privately Doniphan favored the Union, but found it hard to go against his friends and associates. During the secession crisis in Missouri at the beginning of the American Civil War, Atchison sided with Missouri's pro-Confederate governor, Claiborne Jackson. He accepted an appointment as a major general in the Missouri State Guard. Atchison actively recruited State Guardsmen in northern Missouri and served with Missouri State Guard commander General Sterling Price in the summer campaign of 1861. In September 1861, Atchison led 3,500 State Guard recruits across the Missouri River to reinforce Price, and defeated Union troops that tried to block his force in the Battle of Liberty. Atchison continued to serve through the end of 1861. In March 1862, Union forces in the Trans-Mississippi theater won a decisive victory at Pea Ridge in Arkansas and secured Union control of Missouri. Atchison then resigned from the army over reported strategy arguments with Price and moved to Texas for the duration of the Civil War. After the war he retired to his farm near Gower, and was noted to deny many of his pro-slavery public statements made prior to the Civil War. In addition, his retirement cottage outside of Plattsburg, Missouri burned to the ground before his death in 1886. This included the complete loss of his library containing books, documents, and letters which documented his role in the Mormon War, Indian affairs, pro-slavery activities, Civil War activities, and other legislation covering his career as a lawyer, senator, and soldier. Inauguration Day—March 4—fell on a Sunday in 1849, and so President-elect Zachary Taylor did not take the presidential oath of office until the next day. Even so, the term of the outgoing president, James K. Polk, ended at noon on March 4. On March 2, outgoing vice president George M. Dallas relinquished his position as President of the Senate, at which time Atchison was elected President pro tempore. In 1849, according to the Presidential Succession Act of 1792, the Senate president pro tempore immediately followed the vice president in presidential line of succession. As Dallas's term also ended at noon on the 4th, and as neither Taylor nor Vice President-elect Millard Fillmore had been sworn-in to office on that day, it was claimed by some of Atchison's friends and colleagues that on March 4–5, 1849, Atchison was Acting President of the United States. Historians, constitutional scholars and biographers all dismiss the claim. They point out that Atchison's Senate term had ended on March 3. When the Senate of the new Congress convened on March 5 to allow new senators and the new vice president to take the oath of office, the secretary of the Senate called members to order, as the Senate had no president pro tempore. Furthermore, the Constitution doesn't require the President-elect to take the oath of office to hold the office, just to execute the powers. Also, as Atchison never swore the presidential oath either, he could not have acted as President. Most historians and scholars assert that as soon as the outgoing President's term expires, the President-elect automatically assumes the office; although some claim instead that the office is vacant until the taking of the oath. It was in this way: Polk went out of office on March 3, 1849, on Saturday at 12 noon. The next day, the 4th, occurring on Sunday, Gen. Taylor was not inaugurated. He was not inaugurated till Monday, the 5th, at 12 noon. It was then canvassed among Senators whether there was an interregnum (a time during which a country lacks a government). It was plain that there was either an interregnum or I was the President of the United States being chairman of the Senate, having succeeded Judge Mangum of North Carolina. The judge waked me up at 3 o'clock in the morning and said jocularly that as I was President of the United States he wanted me to appoint him as secretary of state. I made no pretense to the office, but if I was entitled in it I had one boast to make, that not a woman or a child shed a tear on account of my removing any one from office during my incumbency of the place. A great many such questions are liable to arise under our form of government. Atchison died on January 26, 1886, at his home near Gower, Missouri at the age of 78. He was buried at Greenlawn Cemetery in Plattsburg, Missouri. His grave marker reads "President of the United States for One Day." Atchison County Historical Museum in Atchison, Kansas includes a museum exhibit devoted to Atchison. A historical marker designating the approximate site of Atchison's birth is located along Highway 1974 in the Landsdowne neighborhood of Lexington, Kentucky. ^ a b "David Rice Atchison Biography". Who2.com. Retrieved November 21, 2014. ^ "1801: President for a Day -- March 4, 1849". Senate.gov. May 29, 2014. Retrieved November 21, 2014. ^ United States Senate, Art and History, History Minute: March 4, 1849-President for A Day, Senate.gov. Retrieved February 15, 2017. ^ a b c d e Christopher Klein (February 18, 2013). "The 24-Hour President". The History Channel. Retrieved June 18, 2013. ^ a b c d e f g "Hall of Famous Missourians". House.mo.gov. Retrieved November 21, 2014. ^ "Kansas Bogus Legislature - Alexander W. Doniphan". Kansasboguslegislature.org. Retrieved November 21, 2014. ^ "Index to Politicians: Ashley-Cotleur to Ather". The Political Graveyard. 2013. Retrieved June 18, 2013. ^ "Missouri History: Missouri State Legislators, 1820-2000". Office of the Missouri Secretary of State. 2013. Retrieved June 18, 2013. ^ a b c d e "The Other 12th U.S. President: David Rice Atchison". Trivia-Library. 2013. Retrieved June 18, 2013. ^ "History of the State of Kansas by William G. Cutler - 1883 - Reprinted on kancoll.org". Kancoll.org. Retrieved November 21, 2014. ^ a b Billings, R. A. (1949). Westward Expansion. New York NY: Macmillan. pp. 599–601. ^ a b "Full text of "The crime against Kansas. Speech of Hon. Charles Sumner, of Massachusetts. In the Senate of the United States, May 19, 1856"". archive.org. Retrieved March 16, 2017. ^ "Copy of David R. Atchison speech to proslavery forces - Kansas Memory". www.kansasmemory.org. Retrieved March 16, 2017. ^ a b "President for a Day: March 4, 1849". Washington, D.C.: Office of the Secretary, United States Senate. Retrieved June 20, 2018. ^ "Profile for Atchison, Kansas". ePodunk. Retrieved June 4, 2014. ^ "Thanks for visiting Atchison County's Museum". Atchison County Historical Museum. Retrieved August 11, 2017. ^ "Lexington, Kentucky: One-Day President Birthplace". roadsideamerica.com. Retrieved June 29, 2018. United States Congress. "David Rice Atchison (id: A000322)". Biographical Directory of the United States Congress. McAfee, John J. (1886). Kentucky politicians : sketches of representative Corncrackers and other miscellany. Louisville, Kentucky: Press of the Courier-Journal job printing company. pp. 10–16.